Two years ago today, the External Thermal Control System's Loop A pump failed. My group, SPARTAN, controls the External cooling loops. We have 2 of them, and they flow pure ammonia through their lines. Each loop cools half of each module (which each have 2 internal cooling loops) and half of the electrical power boxes. Our electrical converters put off a lot of heat (the price of converting power from one voltage to another) and without this cooling, they would overheat and need to be powered off. There is no cross-over capability externally, so those boxes cooled by one loop cannot be cooled by the other loop. So, on July 31st, 2010, the power feed to the Loop A pump failed, causing that ammonia to go stagnant. As a result, we had to turn off the power converters on the loop. It leaves you in a terrible place- there's no spare power for payloads and you have to turn off most of your redundant computers, so its putting all your eggs in one basket. Another coolant loop or power failure could break all your eggs! The pump is the size of a washing machine , full of pressurized, dangerous ammonia, and, oh yeah, outside. So to fix it, we needed to do several spacewalks. Usually for spacewalks, the actual crewmembers who are doing the walk practice the actual tasks they will do many times in the Neutral Buoyancy Lab pool. By the time they are on-orbit, in a space suit, they have practiced the exact motions, almost like a choreographed dance. However, for a contingency EVA, they are already on the ISS and have not practiced the task in many many months, if at all. Each EVA was run through several times on the ground by a different pair of astronauts, and then the detailed instructions were delivered to the crew... the best we could do on short notice! 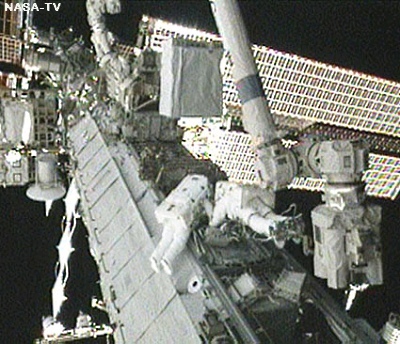 It ended up taking 3 spacewalks to complete the removal of the old pump, and complete install of the new pump. A little over 2 weeks after the pump went down, we had a new pump! It was a very busy time for several members of our team who worked on the EVA plans. I was new, only been certified for a few months, so I spent most of the time watching and learning. Hopefully it'll be a long time before I have to put those skills to use again! This video is from the whole increment, but if you go to 4 minutes (until about 6:30), you can hear actual warning tones (the sound the station makes when something bad happens), space to ground communication, and see some EVA pics/video. Something else besides my birthday to remember?! Wedding Planning Update- 7 months to go!